At the conclusion of the penultimate round of the Isle of Man Masters, no Indian player had any chance of contending for the title prize. Viswanathan Anand with his draw against Vladislav Artemiev had remained on 5.5/8 – and so had Vidit Gujrathi, SP Sethuraman and Adhiban Baskaran. 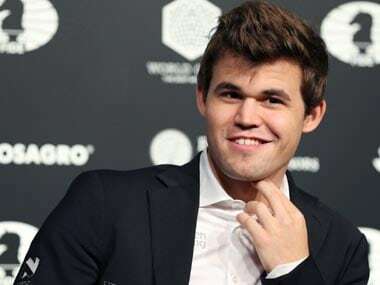 Radoslaw Wojtaszek and Arkadij Naiditsch had defeated Michael Adams and Hikaru Nakamura and had taken sole lead in the tournament. In the final round, they were to face one another, and no matter what the result, none of the Indians would be able to catch up since the leading duo was a full point ahead. However, Maxime Vachier-Lagrave, Wang Hao, Gawain Jones and Jeffery Xiong were very much in the run, being half-a-point behind the leaders. 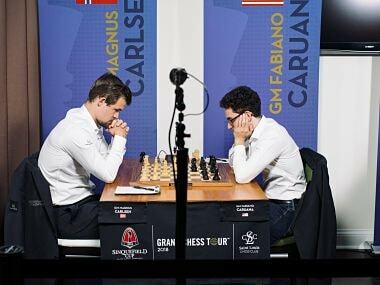 All they needed was a win in the final round while the top board face-off between the leaders finished peacefully. But while Naiditsch and Wojtaszek did sue for peace, none of the chasers managed to pull off a win in the final round, leaving the deadlock at the very top as it was. Naiditsch, who had the white piece, took some calculated risk in the final round. In a Ruy Lopez, he gave up a pawn on his 20th move and immediately followed up with a knight sacrifice in the centre. As compensation, he had supreme control of the a-file and also had a strong bishop and queen battery on the long diagonal. Wojtaszek forced an immediate liquidation on the long diagonal with his 24th move 24…Bf6. Naiditsch was a piece down after this but he did have perpetual checks to his rescue. Perhaps, it was because Naiditsch was banking on these checks if something went wrong that he went for this line that entailed a knight sacrifice. In the second board encounter between the Jeffery Xiong and Gawain Jones, the former had a slight edge for the most part. After a mass exchange of pieces in the middle game, Xiong had emerged with an extra pawn. The queen and knight endgame that had ensued was fairly balanced, however, and once Jones recovered his pawn, a draw was immediately agreed. Vachier-Lagrave had a rough last round against Alexander Grischuk. Going into the round, he was one of the contenders for the title. With the black pieces, Maxime went for his pet Sicilian Najdorf and reached an equal endgame after about 30 moves. Quite clearly, however, Maxime wanted more out of the position. So he pushed and he faltered. And after 64 moves of play, Vachier-Lagrave was forced to throw in the towel. Wang Hao, the fourth of the chasers, was pitted against the Indian number one, Anand. 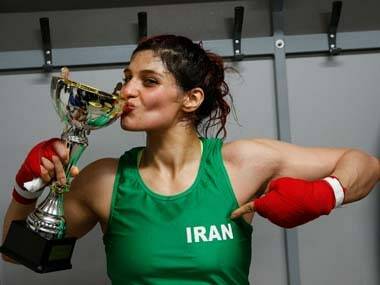 A Queen’s Gambit was on the board. Wang Hao, who had the white pieces, came up with an early novelty. On his eighth move he captured away from the centre and offered an early exchange of queens which Anand quickly accepted. The ensuing endgame remained fairly balanced all the way through and a draw was agreed on move 59. 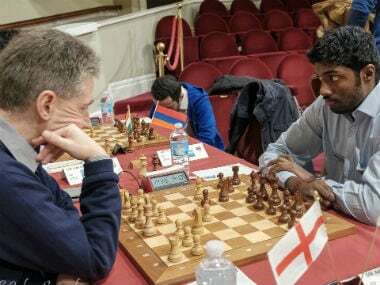 On the tenth board, Adhiban Baskaran scored one of the biggest upsets of the round, defeating the top English Grandmaster, Adams. Adams had played this game in his typical solid style. After about the first thirty moves, an equal rook and knight endgame was reached. Adhiban tried to make something happen by rolling his ‘a’ pawn down the board, but this hardly changed the evaluation. The crunch moment came on the 39th move when Adams allowed his opponent an exchange sacrifice that left Adhiban a piece up at the end of the sequence. But despite his material deficit, Adams had strong compensation in his queenside passer. Adhiban kept finding accurate moves, however, to keep the critical pawn in check. Somewhere around move 50, Adams began to lose his grip on the position. On his 56th turn, Adams allowed a knight fork that lost him his queenside passer and resigned immediately. Once the battles of the final day had come to a close, Naiditsch and Wojtaszek were still in a tie for first. As per the rules of the tournament, this called for a blitz playoff. Two blitz games with a rate of play of five minutes with a two-second increment were to be played between Naiditsch and Wojtaszek. If the score still remained tied, a final Armageddon game was to decide matters. White got five minutes in this game against black’s five with the two second increment remaining constant.But black had draw odds i.e. the black player would be declared the winner in case of a draw again. Both of the first two games were extremely double edged and ended decisively for the white player. In the first game, Naiditsch came out with an extra pawn from the black side of the King’s Indian. Wojtaszek generated a fierce attack after the Azeri Grandmaster faltered later in the game. But when it began to look like Wojtaszek had a decisive material advantage, Naiditsch struck back and restored material equality. However, on his 48th turn, Naiditsch blundered again and this turned out to be fatal. The second game was a Sicilian Defence in which Naiditsch avoided the open variation with 3.Bb5. In a must win situation, Naiditsch found a strong but thematic knight sacrifice on the 10th move. Wojtaszek took the offered knight and was in serious trouble. But once again, the shorter time control induced errors from both sides and going into the endgame, Wojtaszek was only slightly worse. Soon an endgame was reached where white had a rook and two pawns against black’s two minor pieces. After several ups and downs, Naiditsch finally managed to score the much needed win after 77 moves. In the final game – the Armageddon – Wojtaszek had the white pieces and the extra minute. But this also meant he had to win at all cost. By the middle game, the Polish Grandmaster managed to get a better position. Naiditsch, as he had done before, resorted to creating complications. But this time, the boot was on the wrong foot. His 21st move, 21…g5 created too many weaknesses around his king. Wojtaszek attacked energetically and by the 37th move, had caught the black king in a mating net. There was a seven player tie for the second place. One of the players was Grandmaster Adhiban Baskaran, who had hopped into the shared second place after his wonderful win over Adams. Given that he was the 26th seed in the tournament, this is great result for Adhiban. 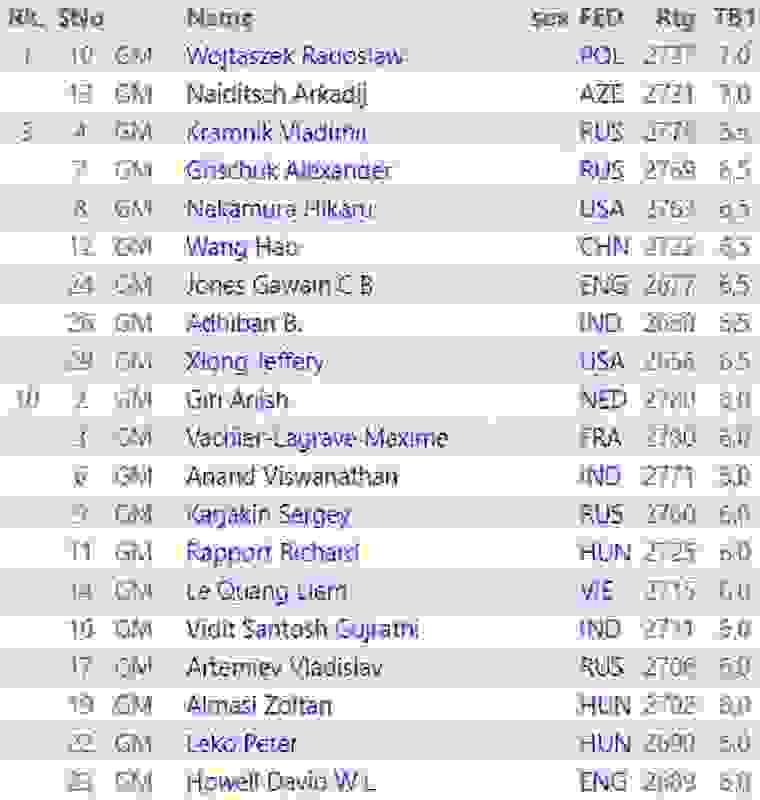 Not to mention, he finished ahead of even the great Anand. But Anand, too, had little to complain. 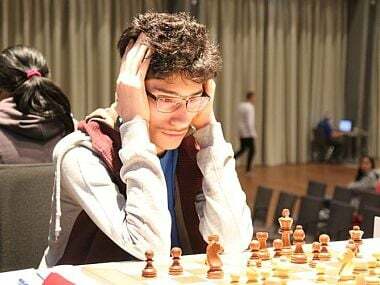 Scoring an undefeated 6/9, he finished joint third alongwith compatriots Vidit Gujrathi, SP Sethuraman and Surya Ganguly.